The paper published an image of Ronan Burke alongside an article about a different person being charged with public order offences. 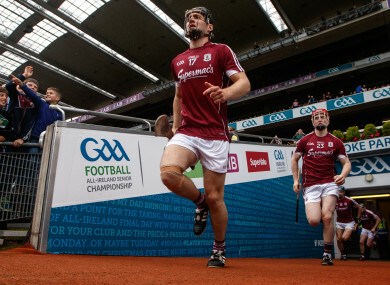 Ronan Burke (centre) representing Galway in Croke Park. GALWAY HURLER RONAN Burke has started High Court proceedings against the publisher of the Irish Daily Star newspaper. The 28-year-old issued proceedings against Independent Star Ltd last Saturday. He is being represented by Simon McAleese Solicitors in Dublin 8. On Friday 22 February the paper published a photograph of the Turloughmore man on the pitch in Croke Park, celebrating Galway’s win in the 2017 All-Ireland final, alongside an article about a 22-year-old Ronan Burke from Gort appearing before Galway District Court charged with public order offences. The paper subsequently issued a correction and apologised to Burke. It is being represented in the proceedings by Fanning & Kelly Solicitors in Dublin 2. Burke is also taking a separate action against Irish Times DAC, which publishes several Irish newspapers including The Irish Times, The Irish Examiner and The Echo. Burke made five appearances for Galway in this year’s Allianz League. As well as winning an All-Ireland title in 2017 he won an under-21 All-Ireland crown in 2011. He is the brother of four-time All-Star Daithí Burke. Email “All-Ireland winning Galway hurler suing Irish Daily Star newspaper”. Feedback on “All-Ireland winning Galway hurler suing Irish Daily Star newspaper”.